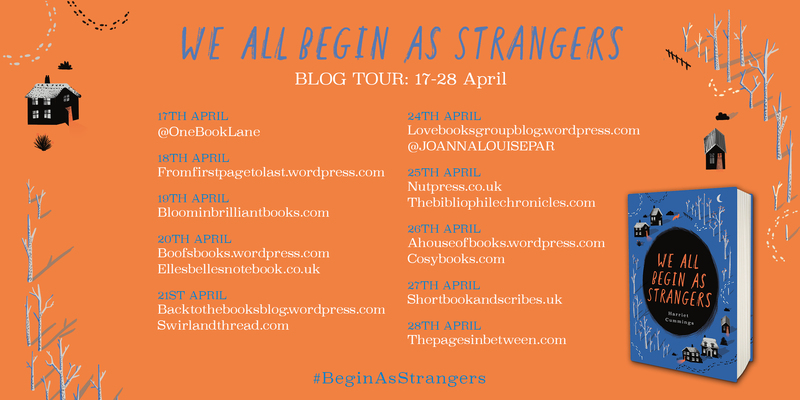 We All Begin As Strangers was published in the UK last week, and is the debut novel by author Harriet Cummings. I was delighted to be asked by Orion Books to take part in the blog tour for the novel, and I thank them and the author for the opportunity. Inspired by true events – a beautiful debut about an English village pushed to the brink, and the secrets its residents are desperate to protect. A mysterious figure is sneaking into homes through backdoors and open windows. Dubbed ‘the Fox’, he knows everything about everyone – leaving curious objects in their homes, or taking things from them. The first thing that really intrigued me about this novel was the fact it was based on real events in the village in which the author grew up in the 1980s. And the novel certainly transports the reader straight away to that period in time. We soon get to know the residents of the small village which is the venue of strange and mysterious happenings, and there is an almost gossipy feel to some of the writing, as we find out about the different residents and their backgrounds. For me it was definitely the setting of the book that made it an enjoyable read. The positives and negatives of living within such a tight knit community really came across well and there was a sense of the almost claustrophobic feel of living in close quarters and knowing – or wanting to know – everyone else’s business. The village setting and the characters gives the novel an almost old-fashioned feel, which I found quite comforting in a way. This is a really lovely read, and despite the seriousness of the storyline, it is still easy to read. I also loved some of the nods towards the 80s, which really strengthened the book’s setting. Overall, I very enjoyable novel by a very promising new author. I’ve been really intrigued about this book since first hearing about it and yours is the first review I’ve read – it sounds great and something that I think I’d love!